LAS CRUCES, N.M. – New Mexico State head coach Kathy Rodolph announced the 2014 softball schedule, Friday, Nov. 22 featuring 14 home games including the annual Aggie-hosted Hotel Encanto Classic and Troy Cox Classic. The NM State Aggies begin their season on Feb. 7-9 by hosting the Aggie Hotel Encanto Classic, which brings in Nebraska, UTEP, Florida St., and St. Mary’s. Just five days after, NM State hosts the sixth annual Troy Cox Classic, a two-day tournament beginning on Feb. 14, 2014 where Northern Carolina University, Texas Tech, Texas A&M-Corpus Christi and Iowa State travel in to compete. After, the Aggies travel south to El Paso, Texas to oppose ICW and Houston Baptist in the UTEP Tournament on Feb. 21-23. To complete the first month of the season, the NM State Aggies make their way to Las Vegas, Nev. on Feb 28- March 2, competing against Weber State, Seton Hall, Binghampton, UNLV and DePaul. Finally the Aggies finish off the week by traveling to El Paso to face the UTEP Miners on March 4. 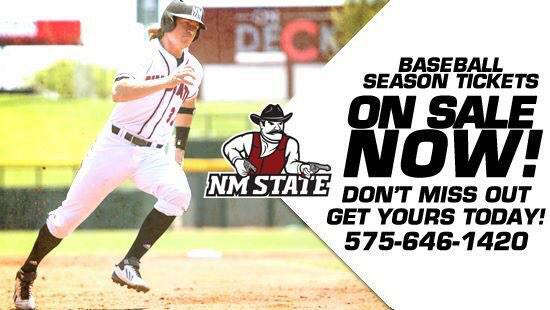 The NM State Aggies next travel to Lubbock, Texas to compete in the Texas Tech Tournament against UT Arlington, Northern Colorado and host team, Texas Tech. NM State takes a short break from the tournaments to face San Jose State, March 13, rekindling the 2013 Western Athletic Conference championship matchup. Rounding out tournament play for the 2014 season, the Aggies head to Fresno Calif., to meet University of the Pacific, St. Mary’s, Colorado State, Cal Poly and host Fresno State, March 14-16. Back home, the Aggies take on the New Mexico Lobos on March 19. The team then hosts cross-border rival UTEP at the NM State Softball Complex on March 25. After hosting Seattle U at the Aggies home field on March 28-29 to open conference play, NM State travels to Kansas City for the first time since 2005 for a two-day trip beginning April 4-5. The Aggies finish off their home season with three games against the Bakersfield Roadrunners on April 11-12. Finally, the Aggies have travel dates scheduled to compete against the Grand Canyon ‘Lopes on April 18-19 in Phoenix, Ariz., the Arizona Wildcats on April 23 and Utah Valley in Orem, Utah on April 25-26. To conclude the regular season the NM State Aggies travel to Albuquerque to meet in-state rival, New Mexico for the second time in the regular season. NM State then heads to the WAC Tournament in Seattle, Wash. on May 5-8. The Aggies wrapped the 2013 season with a second-place finish in the WAC after a 37-20 season performance, 18-7 during league play. NM State set a new winning streak record with 11 straight wins, including a 3-2 win over No. 17 Arizona. In her sophomore season, center fielder Staci Rodriguez claimed the WAC Player of the Year title after leading the conference with 20 home runs and a .780 slugging percentage. She, along with five other Aggies picked up first and second team All-WAC honors.